View larger. | Dates of full moons – indicated by the red dots – in the early part of this century. In our Gregorian calendar, there are 35 dates on which Easter can take place. It can be anywhere between March 22 and April 25. The nearest April 25 years are 1943 and 2038. The nearest March 22 years are remote: 1818 and 2285. Chart via Guy Ottewell. Much of this article was originally published at Guy Ottewell’s blog. Reprinted here with permission. Easter Sunday is April 21, 2019 – a late Easter, but not the latest it can be. In 2011, Easter fell on April 24. In 2030, it will again be on April 21, and in 2038 it will be on April 25, really the latest possible for those of us who use the Gregorian calendar. 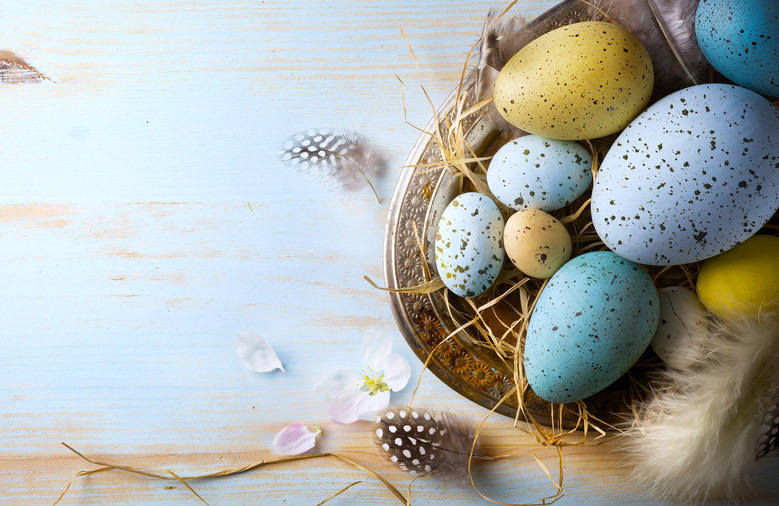 Easter is the great movable feast – great, because many other holy days for Christians are set by the date of Easter Sunday, including Shrove Tuesday, Ash Wednesday, Maundy Thursday, Good Friday and Whitsun. The date is movable because it depends on astronomical events that shift. The rule is that Easter is the Sunday after the full moon that is next after the March equinox. Well. In 2019, the equinox was on March 20 at 21:58 UTC. The full moon crested less than four hours later on March 21 at 1:43 UTC. That was a Thursday, so Easter should have been the next Sunday, March 24 – one of the earliest Easters! Those astronomical calculations were the kind we can make our computers do with enormous precision and complexity (there are more than 600 terms in the equations to find the position of the moon). The Easter rule was agreed on in 325 A.D. by the Council of Nicaea, the first ecumenical council of the Christian church. It assumes that the equinox is on March 21 (astronomically it can be on March 19, 20, or 21 in our Gregorian calendar). And the ecclesiastical calculation uses the Metonic cycle, an ancient Greek discovery that phases of the moon repeat on the same dates each 19th year, almost though not quite exactly. Tables of Golden Numbers (orders in the Metonic cycle) and Epacts can be read off to give the Easter date. This process can be translated into a short set of equations to use in a program (such as mine) to give the ecclesiastical Easter date. It generally agrees remarkably well with the astronomical result. The last time it didn’t was 38 years ago, in 1981. This year is also one of the exceptions. The equinox, being considered to be on March 21, is on the same date as the full moon; so the next full moon is April 19, a Friday – Good Friday – and the Sunday after that is Easter. By coincidence, the spring equinox on Mars this year is only just after Earth’s: March 22, 22:00 UTC. Amusing, and confusing. For a few minutes, looking at my list of dates, I found myself subtracting the wrong equinox from the full moon. If you celebrate it, happy Easter in 2019! From Bruce McClure: By the wqy, April 21 will be the date for Western Christendom. Easter Sunday for Eastern or Orthodox Christendom will fall on April 28, 2019. That’s because the Eastern Church bases Easter on the old style Julian calendar, instead of the revised Gregorian calendar used by Western Christianity and most of the world. Bottom line: For most Christians, 2019’s Easter Sunday will fall on April 21.